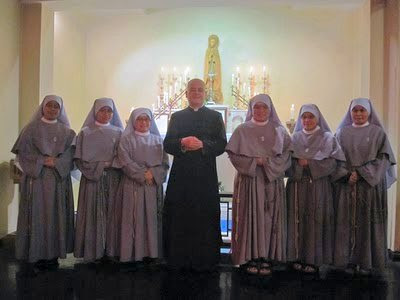 Last night the Franciscan Sisters of the Immaculate came to my parish to sing for the Mass of the Immaculate Conception. It was a privilege to be able to pray and sing with them on their feast day. Thanks to Mulier Fortis for the photo. [...] she is deserving to be preached abroad because she never committed any sin, even the least; because sin had no part in her; because, through the fulness of God's grace, she never thought a thought, or spoke a word, or did an action, which was displeasing, which was not most pleasing, to Almighty God; because in her was displayed the greatest triumph over the enemy of souls. Wherefore, when all seemed lost, in order to show what He could do for us all by dying for us; in order to show what human nature, His work, was capable of becoming; to show how utterly He could bring to naught the utmost efforts, the most concentrated malice of the foe, and reverse all the consequences of the Fall, our Lord began, even before His coming, to do His most wonderful act of redemption, in the person of her who was to be His Mother. By the merit of that Blood which was to be shed, He interposed to hinder her incurring the sin of Adam, before He had made on the Cross atonement for it. And therefore it is that we preach her who is the subject of this wonderful grace.